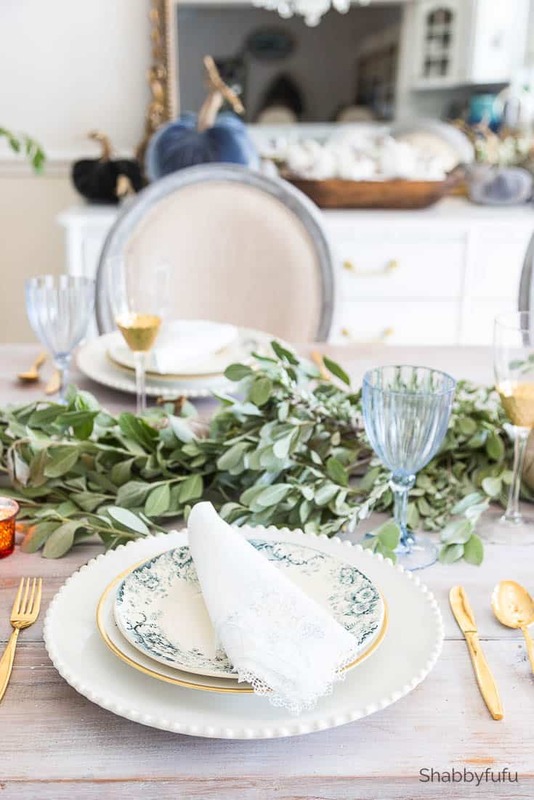 Elegant rustic French country table setting ideas to inspire you for your Thanksgiving dinner, and the concept is switchable for any occasion! 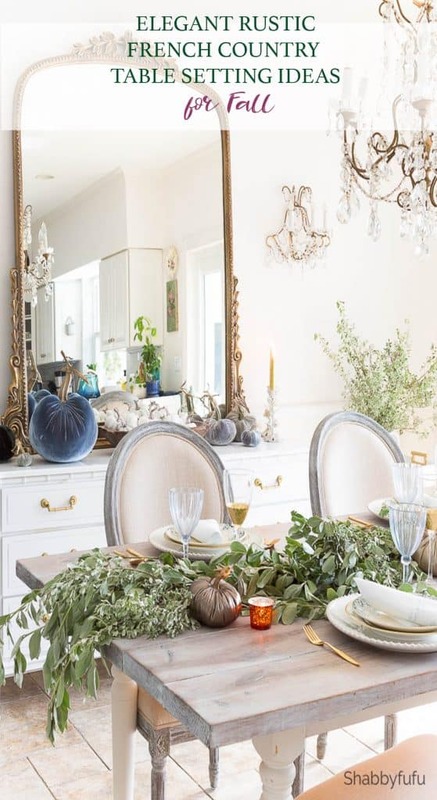 Come join me and several friends, in the Styled + Set Fall Entertaining Tour, hosted by the talented Lory of Designthusisam. You are guaranteed to find inspiration today and the tour is a week long event! This is my impromptu table setting and although my style may look expensive I assure you that it’s budget friendly. If you’re coming over from my good friend Ann’s blog over at On Sutton Place, she shares loads of budget friendly ideas as well. My own style is decidedly leaning over to the French countryside of design, with a rustic touch alongside some elegance in the dining room. 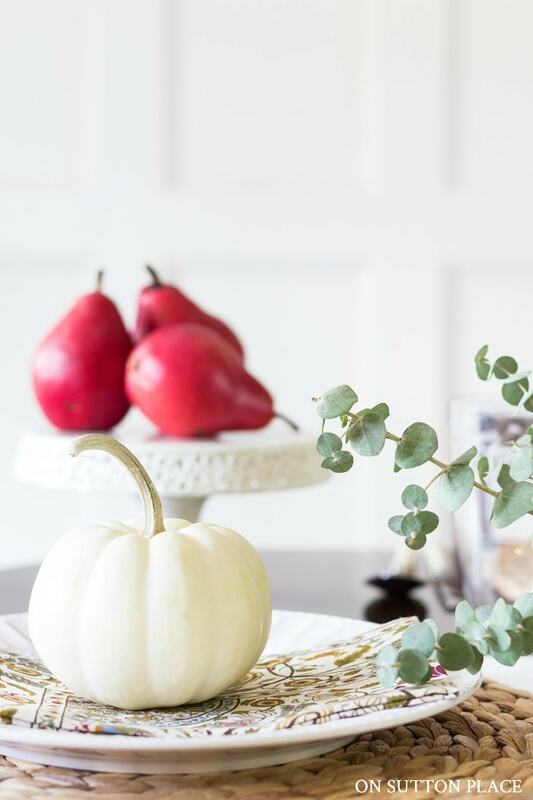 So let me break down what I did and hopefully that will get you thinking about your fall entertaining and bring it up a couple of notches. It started with the beautiful velvet pumpkins on my sideboard in shades of blue, grey and taupe. I’ve been incorporating more grey into our home and toning down the white. The very first thing that I did was to grab my garden clippers and head outside. It was time to trim the silver buttonwood hedges out in front of our home. They make for a beautiful table garland with the velvety leaves, similar to lambs ear. Velvet pumpkins, velvety leaves…and free for the clipping. I also clipped some heather that has smaller leaves that are a soft sage green. 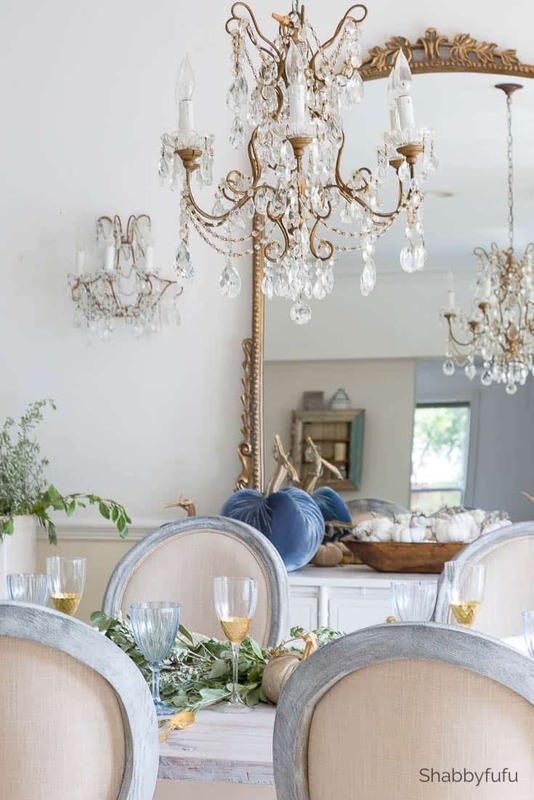 If you have access to a variety of clippings, look for textures that are softly muted for a French rustic theme. Since the clippings were free I overloaded them on the table to drape down on the two ends. Real or faux, I love the look and you’ll often see this in weddings. My vintage crock has more of the same for that elegant rustic french country look. On either side of the buffet that was a thrift store makeover (see that post HERE) I placed a small table. These really come in handy for Thanksgiving or parties for extra plates and barware! 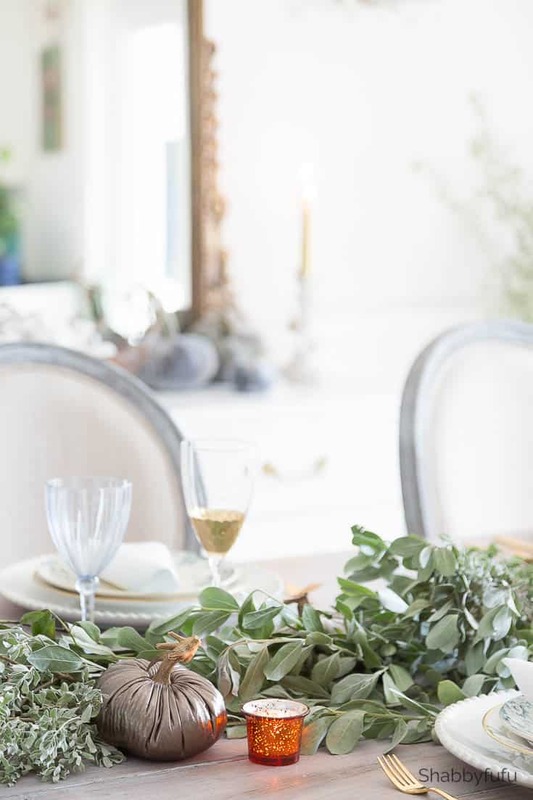 For this tablescape rehearsal dinner they have the free garden clippings and fill in negative space in the room nicely without overwhelming. 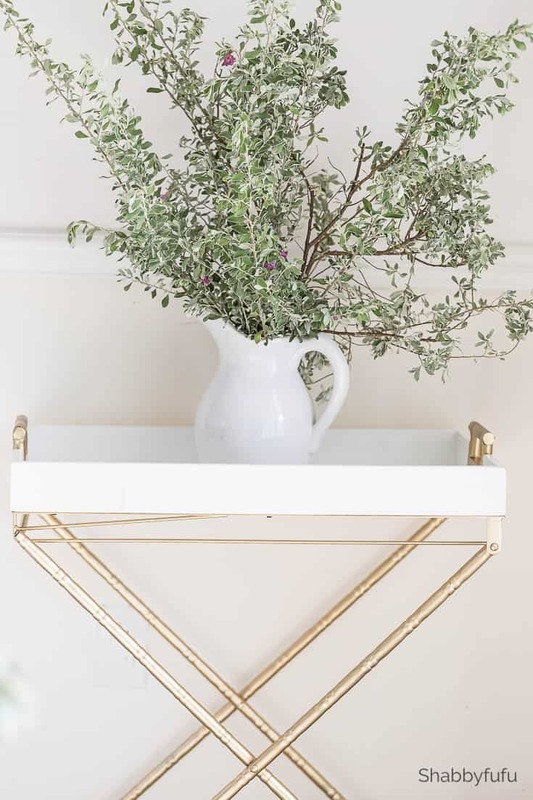 Gold is my choice of metallic accent and by carrying this through the room softly it creates movement and shine. 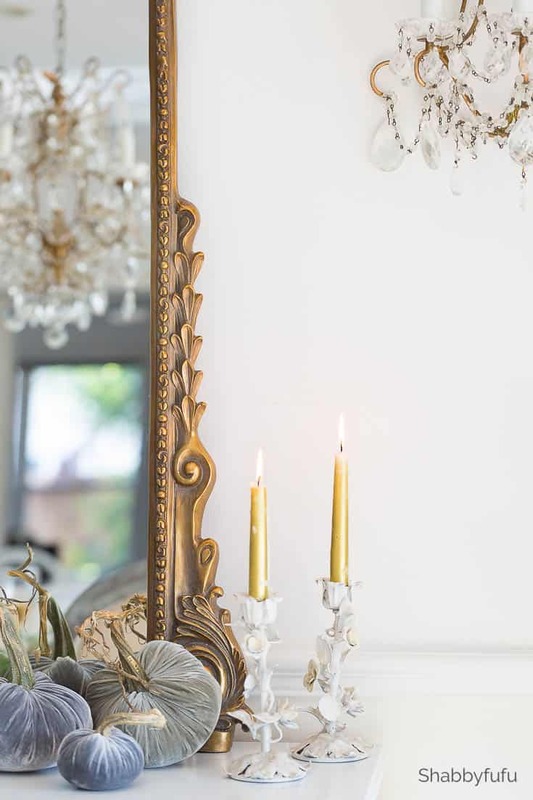 Recently I decided to touch up some of the faded gilding on the light fixtures in the dining room with THIS PRODUCT. I used the European Gold…no surprise there;-) To me…gold and blue and just perfect together. 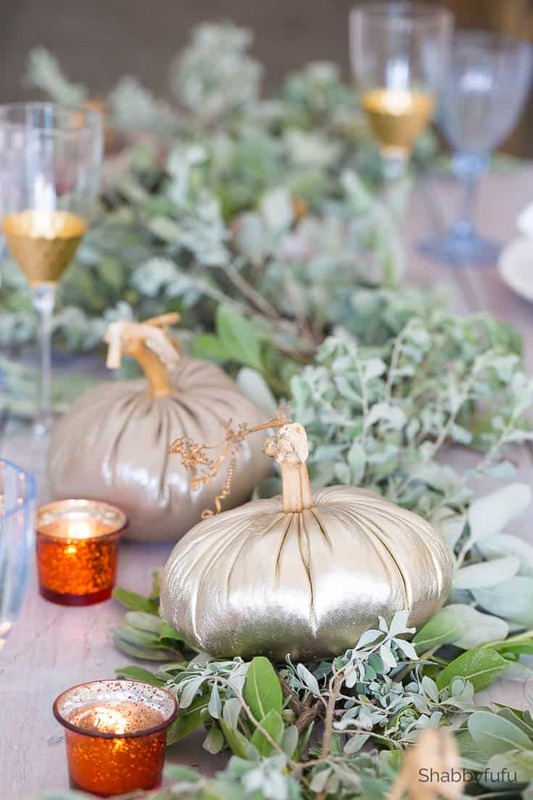 Champagne pumpkins with real stems have had my heart for several years now and are placed throughout the garland along with votives. *HINT* If you are using votive candleholders in a tablescape, use tealights instead of the larger votive candles for safety. They should last you all through the evening of your dinner party with no worries! Vintage gold flatware surrounds the triple layers of plates. I set out one large white charger first, then two layers of smaller plates that will be removed with with different courses. 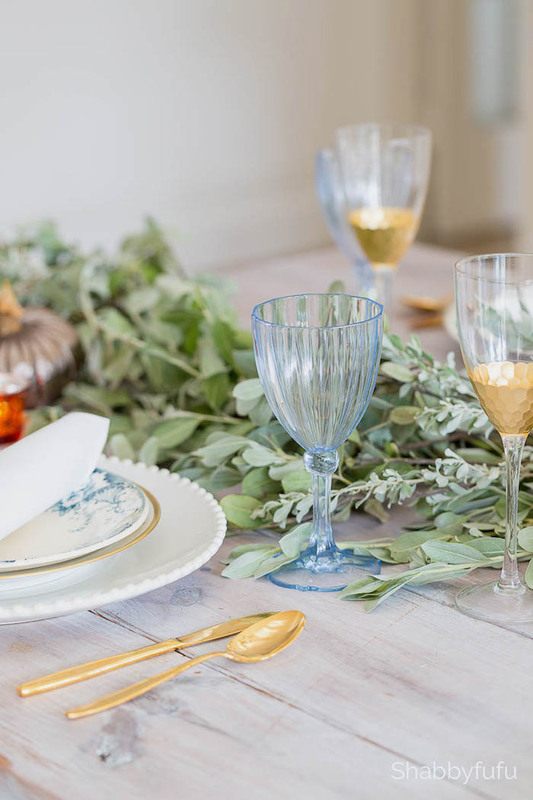 Gilded wine glasses and blue ACRYLIC stems, just in case we take the party outdoors later on. Do you see the flow of color and texture in this setting? Back away when you think you are finished setting your table and look at it like a painting. Does anything need to be moved or perhaps removed? 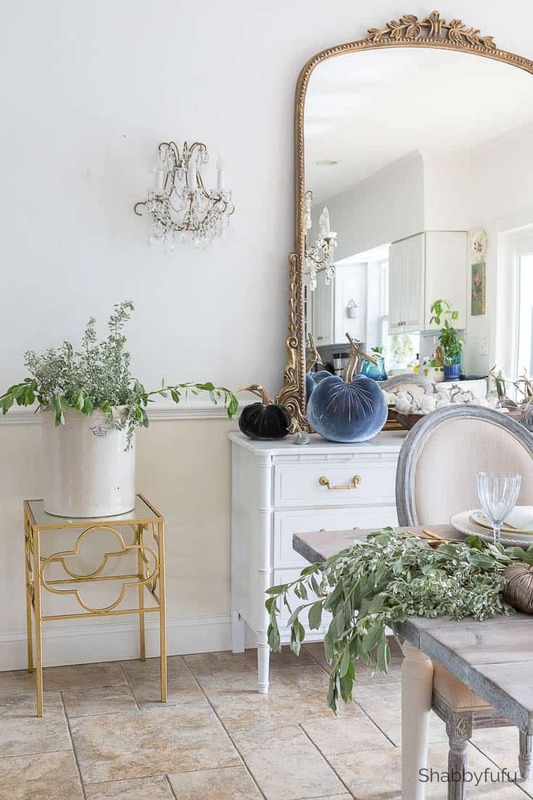 A mix of vintage French, linen and lace, new, old, metallics, velvet and FREE FOLIAGE from the garden makes it all come together. I’d love to hear from you in the comments and be sure to head over to my talented friend Courtney of French Country Cottage who is next in today’s line up! Absolutely stunning. 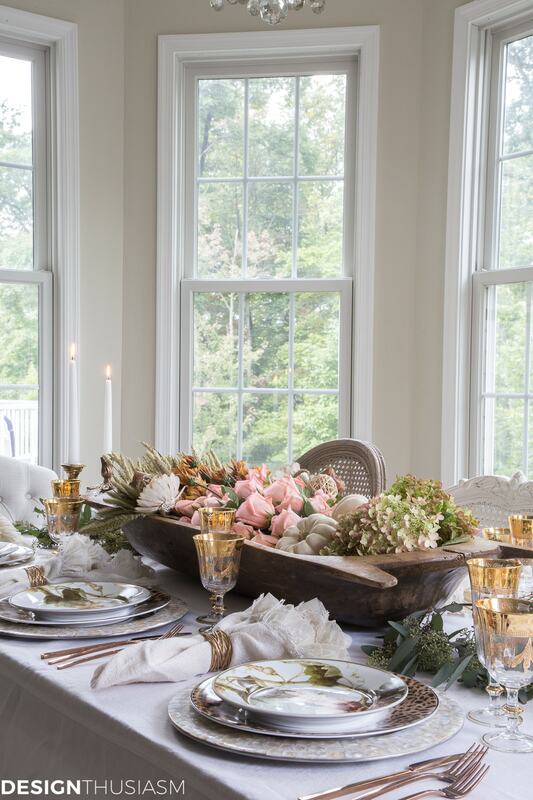 I love the soft muted colors and using the greenery down the center of the table is such a beautiful idea. 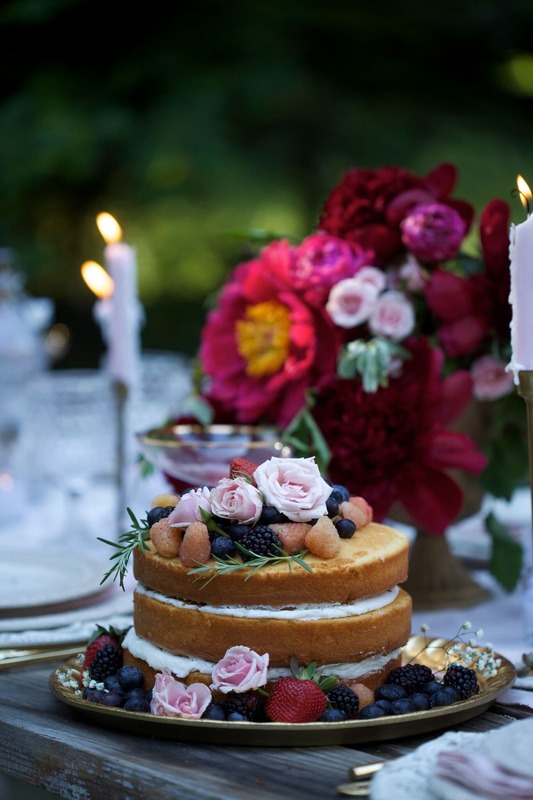 Gorgeous tablesetting. I especially love the vintage napkins. Thank you Marty for visiting and I love using what I have without spending anything extra! I love how you always have a different color as the main theme! This time the blue is so beautiful! Thanks so much Maria…happy fall day to you! The tablescape is so beautiful. Janet I never thought the pairing of country and gold could look so good! You have a beautiful table. You always set a wonderful table. One thing I don’t have access to is live greens in our yard. Lots of boxwoods but I don’t want to disturb the bushes. Maybe I should I think that would be pretty as it drys. Thoughts? Thank you Cindy…but I would say YES to clipping boxwoods! Maybe try clipping on the backside? Absolutely gorgeous, Janet! Of course, I’m partial towards the velvet pumpkins, and the blue/gray are SO pretty! 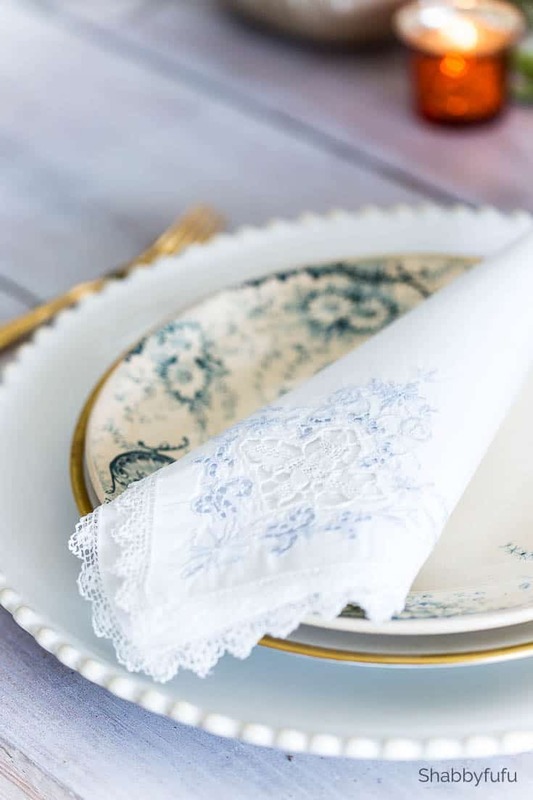 The lace napkins add the perfect finishing touch to your amazing tablescape! Pinned (to two boards) and shared! Thank you Julie…and you did a great job on your velvets! 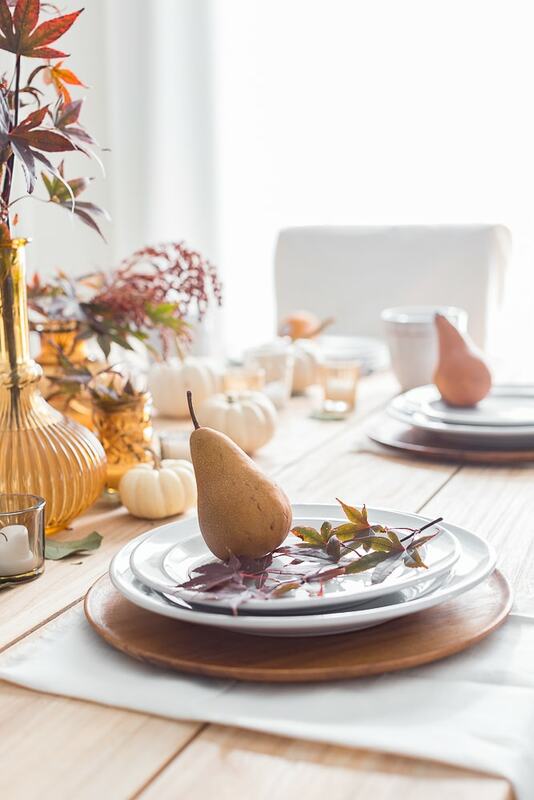 Your style is beautiful any time of year, for these Fall table settings are just gorgeous! Thanks for sharing so much inspiration. Your dining room is stunning! If I came over for dinner, you’d have to drag me out of there! Pinning! Come on over any time…thank you! Things grow wild here and I always have a bounty of clippings. Flowers not so much though…they just get burned up by our hot sun. Everything is so lovely. Those velvet pumpkins are gorgeous. Thank you so much Marilyn…enjoy your fall season! Janet, your greenery is stunning! I can’t believe you have that right outside your house! And of course you know I love all the French bits. This gorgeous table is speaking my language!! Beautiful as usual, Janet. Love those blue glasses! Thanks so much Angie…enjoy your day! So simple but so elegant! I have never heard of silver buttonwood, but you can bet I’m going to look into it! I thought your table garland was seeded eucalyptus. It is absolutely stunning. 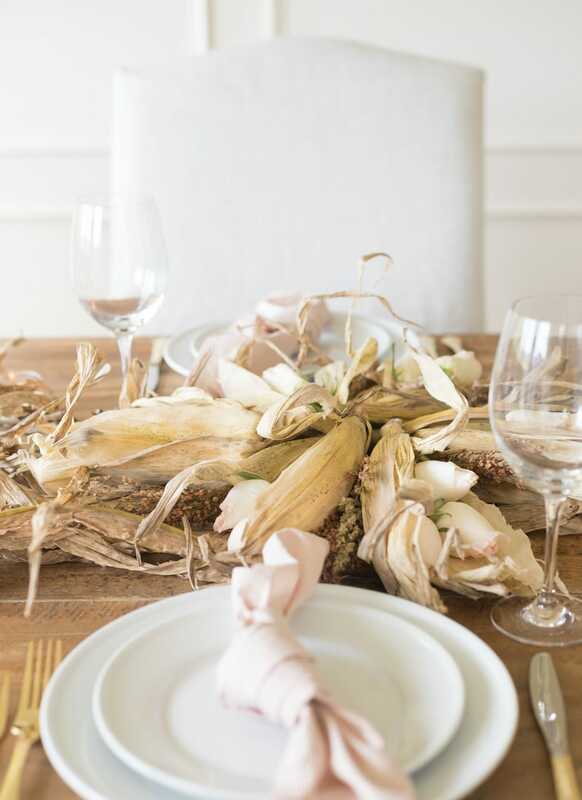 Thanks for all the tablescape eye candy in this post! It’s pretty carefree, which is a plus! You have the most elegant pictures! I love what you do. I just drool all over myself everytime I look at your photos. What a lovely thing to say Nikki…thank you! Such inspiration at times I feel overwhelmed while tripping over myself looking at these photos. Thank you for always being so clear with the directions for your DIY’s and fun style of writing. I hope that I make things clear in DIYs because sometimes taking photos while creating simply slips my mind! Actually both my husband and I are second borns, lol! His whole family are type A and my family…all over the place in terms of personalities!